A research team led by astronomers at the University of Washington and Harvard University has discovered a bigger version of Earth locked in an orbital tug-of-war with a much larger, Neptune-sized planet as they orbit very close to each other around the same star about 1,200 light years from Earth. 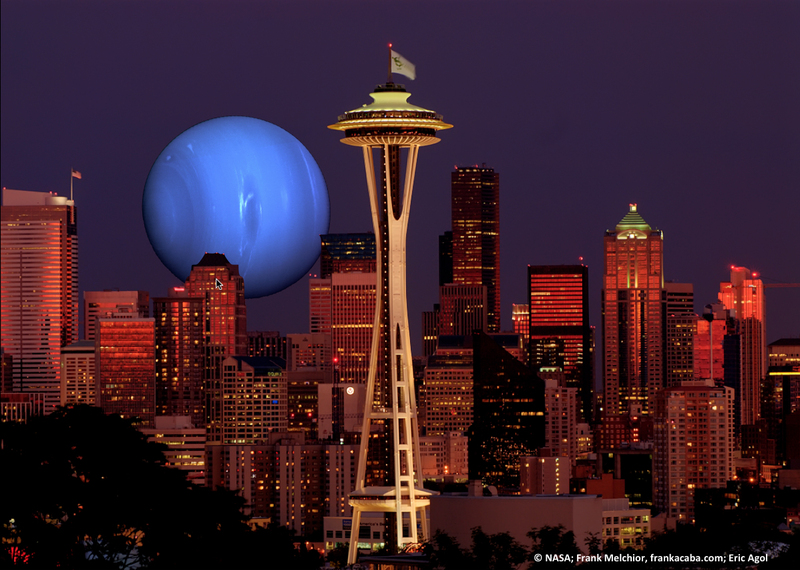 This image, adapted by Eric Agol of the UW, depicts the view one might have of a rising Kepler-36c (represented by a NASA image of Neptune) if Seattle (shown in a skyline photograph by Frank Melchior, frankacaba.com) were placed on the surface of Kepler-36b. The planets occupy nearly the same orbital plane and on their closest approach come within about 1.2 million miles of each other – just five times the Earth-moon distance and about 20 times closer to one another than any two planets in our solar system. 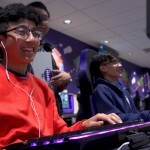 But the timing of their orbits means they’ll never collide, said Eric Agol, a UW astronomy professor and co-lead author of a paper documenting the discovery published June 21 by Science Express, the online edition of the journal Science. Orbiting a star in the Cygnus constellation referred to as Kepler-36a, the planets are designated Kepler-36b and Kepler-36c. 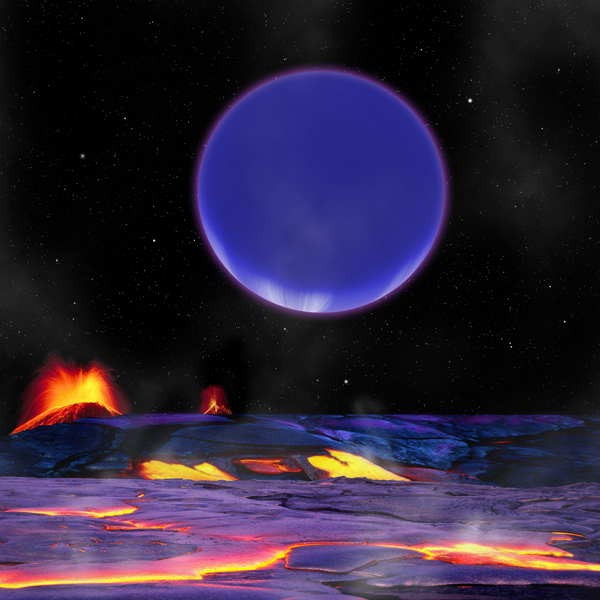 Planet b is a rocky planet like Earth, though 4.5 times more massive and with a radius 1.5 times greater. Kepler-36c, which could be either gaseous like Jupiter or watery, is 8.1 times more massive than Earth and has a radius 3.7 times greater. The larger planet was originally spotted in data from NASA’s Kepler spacecraft, which uses a photometer to measure light from distant celestial objects and can detect a planet when it transits, or passes in front of, and briefly reduces the light coming from, its parent star. The team wanted to try finding a second planet in a system where it was already known that there was one planet. Agol suggested applying an algorithm called quasi-periodic pulse detection to examine data from Kepler. Joshua Carter, a Hubble fellow at the Harvard-Smithsonian Center for Astrophysics and the other co-lead author of the Science paper, used the algorithm to begin methodically checking planetary systems already in the Kepler data and saw a clear signal in the Kepler-36a system. The data revealed a slight dimming of light coming from Kepler-36a every 16 days, the length of time it takes the larger Kepler-36c to circle its star. Kepler-36b circles the star seven times for each six orbits of 36c, but it was not discovered initially because of its small size and the gravitational jostling by its orbital companion. But when the algorithm was applied to the data, the signal was unmistakable. 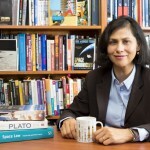 “If you look at the transit time pattern for the large planet and the transit time pattern for the smaller planet, they are mirror images of one another,” Agol said. The fact that the two planets are so close to each other and exhibit specific orbital patterns allowed the scientists to make fairly precise estimates of each planet’s characteristics, based on their gravitational effects on each other and the resulting variations in the orbits. To date, this is the best-characterized system with small planets, the researchers said. They believe the smaller planet is 30 percent iron, less than 1 percent atmospheric hydrogen and helium and probably no more than 15 percent water. The larger planet, on the other hand, likely has a rocky core surrounded by a substantial amount of atmospheric hydrogen and helium. The planets’ densities differ by a factor of eight but their orbits differ by only 10 percent, which makes the differences in composition difficult for the scientists to explain using current models of planet formation. The team also calculated specific information for the star itself, determining that Kepler-36a is about the same mass as the sun but is just 25 percent as dense. It also is slightly hotter and has slightly less metal content. The researchers concluded that the star is a few billion years older than the sun and no longer burns hydrogen at its core, so has entered a sub-giant phase in which its radius is 60 percent greater than the sun’s. The research was funded by NASA, the Space Telescope Science Institute and the National Science Foundation. In addition to Agol and Carter, the Science paper has 44 co-authors from institutions in the United States, the United Kingdom, Australia, Denmark and The Netherlands. For more information, contact Agol at 206-543-7106 or agol@astro.washington.edu or Carter at 617-495-7278 or jacarter@cfa.harvard.edu. Also see a story on this discovery from the Harvard-Smithsonian Center for Astrophysics.